Since 1794, seafood has been sold here, making it perhaps the oldest continuously operating fish market in the United States. After the redevelopment efforts of the 1960s, permanent seafood sales boats were located at the Municipal Fish Wharf, at 1100 Water St. S.W. The fishing boats no longer come up the Potomac with their haul (the fish are almost all trucked in), but the shops remain. 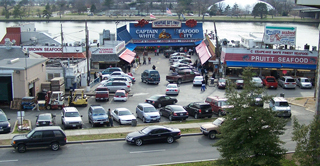 The wharf hours are 7:30 a.m. to 8 p.m daily. The current fish market is immediately adjacent to a huge development project (The Wharf). Eventually the project will include a restoration of the historic oyster shed, a new operations building, a new fish-cleaning buildling, a new distillery, a market shed and two small market pavilions. The new Fish Market site also includes improved access to the Wharf development nearby. Parking is still very limited. Pedestrian access is now available with a footbridge from L'Enfant Park and the Mall. Pruitt Seafood, 11th & Maine Ave. S.W., 202-554-2669. Captain White's Seafood City, 1100 Maine Ave. S.W., 202-484-2722. Yelp reviews of the Captain White's Seafood are shown below.